Thanks to our Order partner Dan Radcliffe. com, we know of a new video interview with actor Dan Radcliffe via Broadway.com. In a delightful series of question and answers, Dan says that he is a huge cartoon fan (loves SpongeBob SquarePants), talks about his Equus work schedule, living in New York city, and says most decidedly NO to ever wanting to be in a Harry Potter musical. He goes at length on this particular subject, showing light-hearted but clear dismay at the thought of such a project, noting this is not what the series is about and he hopes it does not happen (“it would not have my blessing let’s just say”). 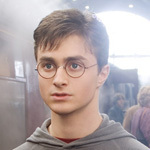 Dan Radcliffe also confirms again that he will begin filming Harry Potter and the Deathly Hallows on February 15.
) For those that missed it earlier, readers of the same Broadway.com site had voted Dan ‘Star of the Year‘ in a online poll.